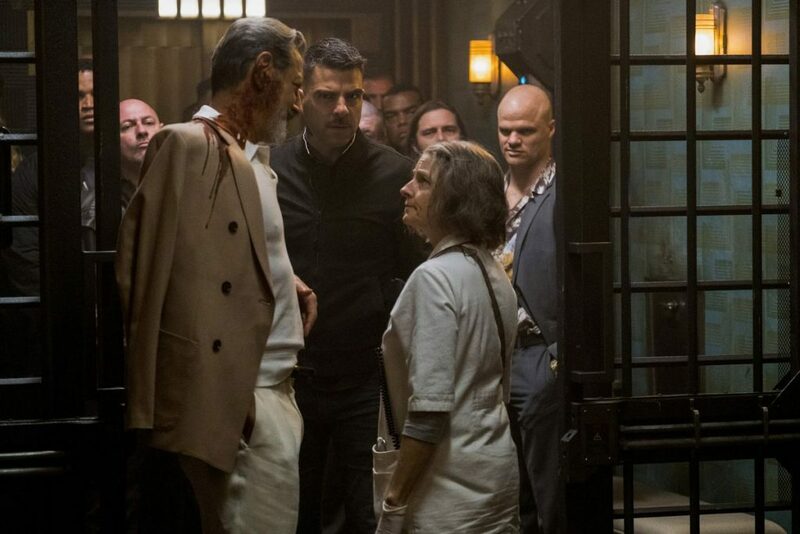 Hotel Artemis is a pulpy little beast that takes a rather absurd premise and runs full-steam ahead into the criminal underworld with it. It is also presented with cinematography of the variety that would set Tarantino’s mouth frothing with full-pelt randy dog excitement; so abundant as it is with primary colour overload. 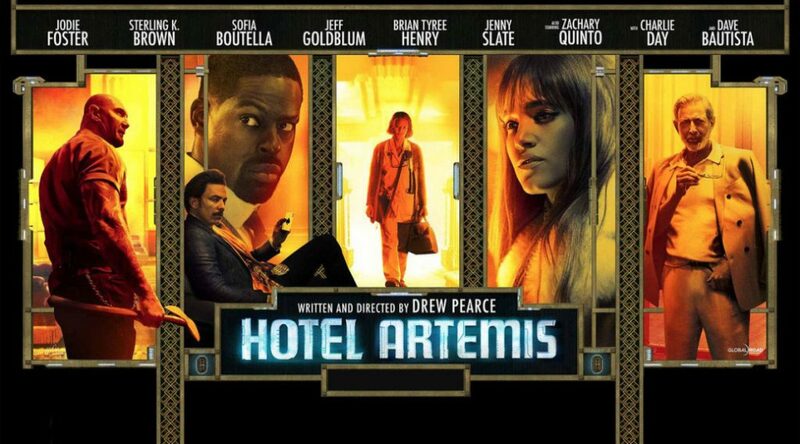 Set in the near distant future – 2028, to be precise – the titular Hotel Artemis is a bit like a cross between a private hospital and Soho House* (*other exclusive, upmarket hostelries are available). It’s also the sole preserve of wounded criminals seeking care and physical restitution. You don’t have to have done the time to commit the crime to qualify, but you must be a fully-fledged badass and committed miscreant to be part of this special club. 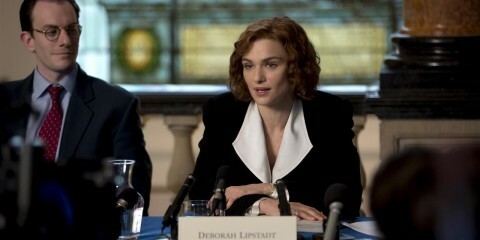 The hospital is overseen by Jodie Foster’s ‘the Nurse’ and her loyal lackey ‘Everest’ (Dave Bautista). 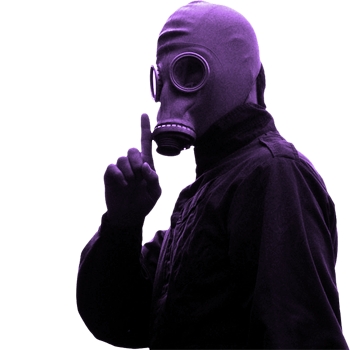 Events play out over a single night, with the challenge of the Nurse’s past coming to compromise the hitherto devout regulations of this haven for the immoral. To add the frisson of danger to this compromise, there is the urgent admittance of founder and bankroller of the enterprise, Niagra (Jeff Goldblum). With such a volatile concoction of bandits, it is only a matter of time before the wheels come a-fallin’ off. And fall off they do. Director Drew Pearce has sculpted a work that clearly strikes close to his heart. 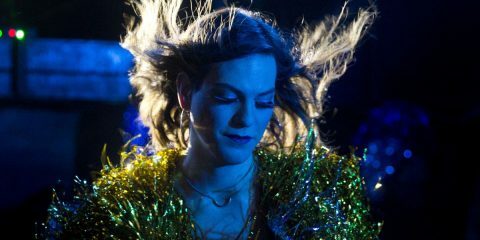 It zips and dances across 95 minutes of wry asides, dystopian madness and violent tete-a-tetes. This is the sort of middle-ground action flick that struggles to see the light of day in this sanitised blockbuster age of the mega-franchise. 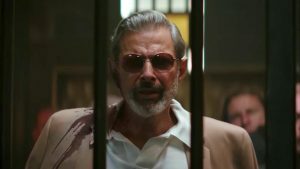 Jeff Goldblum brings his honeyed swagger to the table, Zachary Quinto chews his way through the fabrics of the hotel and his character’s try-hard, hapless quest to get daddy’s approval. 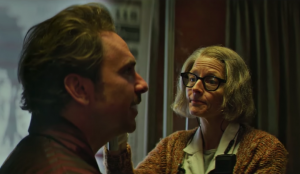 Bautista is almost all of the heart and hope, aside from Jodie Foster as a protagonist haunted by her past: an agoraphobic committed to the mantra of the premises. A uniquely exclusive take on the Hippocratic oath. There is an arc here and it plays out reasonably, and whilst it might be a hackneyed hunk of honking brutality, it’s also not entirely without a diverting allure. There is enough tongue-in-cheek charm to raise, on balance, more chuckles than eyebrows. That said; for all of its boldness and knowing humour, it fails to raise its head above the three-star parapet.